The main job of the kidney is to filter the blood, remove waste products and deliver waste products (urine) through the ureter to the bladder. But what happens when the area where the ureter and the renal pelvis meet becomes blocked in children? The following information should help you recognize this problem before it causes serious damage. Kidneys produce urine by filtering the blood and removing wastes, salts and water. The urine must then drain from the kidney through an internal collecting system that ends in a funnel-shaped structure called the renal pelvis and into a natural tube called the ureter. Each kidney must have at least one functional ureter (some have two) to carry the urine from the kidney to the bladder. What is ureteropelvic junction (UPJ) obstruction? The most common cause of obstruction (blockage) in the urinary tract in children is a congenital obstruction at the point where the ureter joins the renal pelvis the ureteropelvic junction (UPJ). This problem occurs in approximately one in 1,500 children. These obstructions develop prenatally as the kidney is forming and today most are diagnosed on prenatal ultrasound screening. In UPJ obstruction, the kidney produces urine at a rate that exceeds the amount of urine able to drain out of the renal pelvis into the ureter and this causes accumulation of urine within the kidney. This accumulation, also called hydronephrosis, is easily visible on ultrasound and often allows the physician to predict the presence of UPJ obstruction before the baby is born. Although encountered less frequently in adults, UPJ obstruction may occur as a result of kidney stones, previous surgery or disorders that can cause inflammation of the upper urinary tract. What are the symptoms of ureteropelvic junction (UPJ) obstruction? Since the development of ultrasound and its widespread use to screen the unborn child, most UPJ obstructions are identified long before birth. After birth, symptoms of UPJ obstruction may be an abdominal mass, a urinary tract infection with fever, flank pain especially with increased fluid intake, stones and bloody urine. Patients with UPJ obstruction may also have pain without an infection. Some UPJ obstructions are irregular in nature and urine may drain normally at one time and be completely obstructed at others producing sporadic pain. How is ureteropelvic junction (UPJ) obstruction diagnosed? While ultrasound is a very useful screening test it is not diagnostic of UPJ obstruction. In order to make the diagnosis it is necessary to perform a functional test or one that measures the ability of the kidney to produce and drain urine. 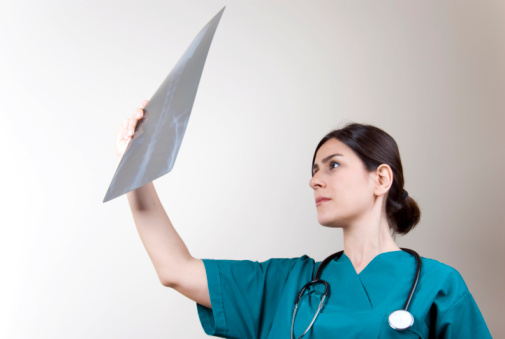 The classic examination is called the intravenous pyelogram (IVP). In this test, a dye is injected into the blood stream and the kidneys remove this substance from the blood. The dye passes into the urine and eventually out of the bladder. The dye is visible on X-ray and the physician can see the shape of the kidney, renal pelvis and ureter. While IVPs continue to be helpful, a more useful examination in children is the furosemides renal scan. This test is done in a similar fashion to the excretory urogram except that a radioactive material is used instead of X-ray dye. The material can be followed with a special camera and this test can give more accurate information about kidney function and drainage. How is ureteropelvic junction (UPJ) obstruction treated? Before considering treatment it is important to understand that poor drainage through the UPJ in infants and young children less than 18 months of age may be temporary. This subject remains controversial and is open to the opinions of different experts. Many infants with good kidney function and poor drainage will have a dramatic improvement of drainage over the first few months of life while some will not improve and others will worsen. For this reason, in this age range, some patients with hydronephrosis (fluid-filled enlargement of the kidney) are watched with repeat CT scans and ultrasounds. This spontaneous improvement usually takes place only within the first 18 months of life. Once the diagnosis of UPJ obstruction is established and there is no further reasonable chance of improvement, the condition requires surgical treatment. The classic treatment of UPJ obstruction is an open operation to remove the UPJ and to reattach the ureter to the pelvis of the kidney creating a wide junction between the two. This operation, called a pyeloplasty, allows rapid and easy drainage of urine produced by the kidney and relieves symptoms and the risk of infection. The procedure usually takes a few hours and has a success rate in excess of 95 percent with one operation. Hospitalization after surgery depends on age of the patient. There are a variety of drainage tubes utilized to promote healing and their use is dependent on the surgeon's preference. The incision is usually just below the ribs and just behind a line that would pass from the patient's arm to their leg on the affected side. The incision is usually two to three inches long. Newer treatment of UPJ obstruction involves minimally invasive surgery. There are two options, a laparoscopic pyeloplasty and an internal incision of the UPJ. Laparoscopic surgery is done by placing several instruments through the abdominal wall and performing the surgical procedure. This procedure is most often done through the abdominal cavity and has the disadvantage of potentially causing scarring or adhesions within the abdomen. Surgeons also cannot utilize techniques that are as delicate in a laparoscopic as in an open procedure. The clear advantages of laparoscopic surgery are less pain and nausea especially in older children and adults. Success rates of laparoscopic pyeloplasty are just being determined but we would expect that they would approach the effectiveness of open surgery with time. The second option is to insert a wire through the ureter and use it to cut the tight and narrow UPJ from the inside. A special ureteral drain is then left in place for several weeks and then removed. The UPJ heals in a more open manner in most patients but the treatment may need to be repeated and success rates are clearly less than those of open surgery. The advantages of this procedure are less pain and nausea. What can be expected after treatment for ureteropelvic junction (UPJ) obstruction? After repair of UPJ obstruction, there is usually swelling of the ureter and continued poor drainage of the kidney for a period of time. This usually changes as the area heals. The surgeon usually obtains a functional test, a few weeks after the procedure, to evaluate how well the kidney is working. Patients usually recover quickly from any of the procedures but some have pain for a few days following surgery and occasionally a drainage tube must be left in place to help drain the kidney while it heals. The appearance of the kidney can continue to improve for years but usually it never looks normal on ultrasound or other studies. Once repaired, a UPJ obstruction almost never recurs. There is nothing that the family can do to prevent further problems with the kidney. Patients may have a slightly increased risk of developing stones and infection throughout their lives because many of the kidneys still contain some pooled urine even though their overall drainage is improved after surgery. What did I do during pregnancy to cause this problem in my child? Nothing. It is not yet known what the causes are or how it can be prevented. Do my other children need screening for UPJ obstruction? Only if they show symptoms. Occasionally there have been cases where a family may have several members suffering from UPJ obstructions but the vast majority are individual cases. Is my baby in pain because of a UPJ obstruction? The general belief is that most children are not in pain unless the urine becomes infected or the obstruction becomes worse. Can my child participate in athletics later? If the other kidney is normal and the affected kidney responds to treatment most experts feel that children can participate in athletics normally. Can the obstruction come back? Not usually. Once it is repaired almost all kidneys continue to work well. Occasionally a child with a partial obstruction as an infant that improved without surgery will return later with symptoms that require surgery.